Dear Students, The List of Candidates shortlisted for PET based on their performance in the Computer Based Test (CBT) of RRB Group D 2018-2019 Online Examination conducted during the period 17-09-18 to 17-12-18 is scheduled to be declared after 15:00 hrs today on 04-03-19. 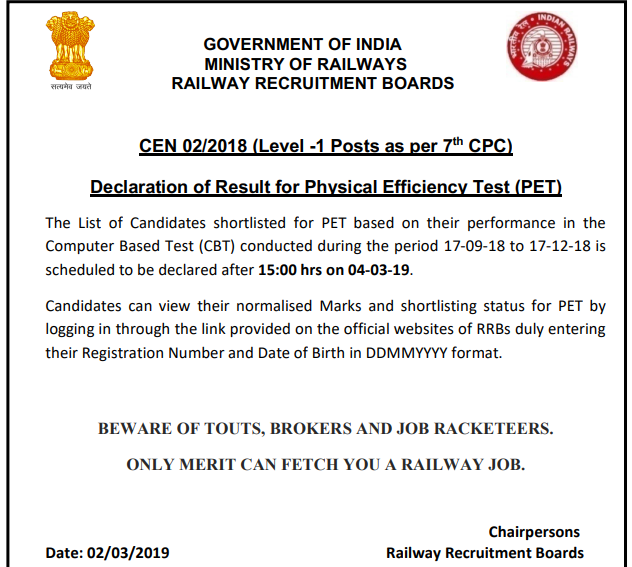 Based on the performance of candidates in the Computer Based Test (CBT) conducted during the period 17-09-2018 to 17-12-2018 by Railway Recruitment Boards(RRBs) for the Level – 1 Posts of 7th Central Pay Commission(CPC) Pay Matrix against Centralised Employment Notice- CEN 02/2018, candidates bearing the Roll Numbers listed hereinunder are provisionally shortlisted to appear in the Physical Efficiency Test (PET). Candidates equal to three times the vacancies have been shortlisted for the PET. Persons with Benchmark disabilities(PwBD) candidates are exempted from PET and hence, their roll numbers are not included in this list. 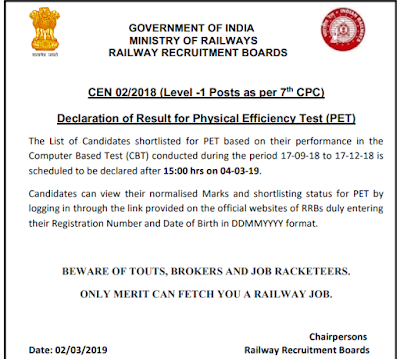 Candidates can view their normalised Marks and shortlisting status for PET by logging in through the link provided on the official websites of RRBs duly entering their Registration Number and Date of Birth in DDMMYYYY format till 15th March 2019. It has been decided by the Ministry of Railways that, henceforth,the conduct of PET, Document Verification, Medical Examination and publishing of Panel for level 1 posts shall be carried out by the Railway Recruitment Cells (RRCs) of the respective Zonal Railways. Accordingly, the PET schedule for the provisionally shortlisted candidates shall be published on the official websites of RRCs by the Chairpersons of RRCs. Further, SMS / Email will also be sent to the registered mobile number and email of the shortlisted candidates to download their e-call letter for PET. The PET is likely to start during the third and fourth week of March 2019. 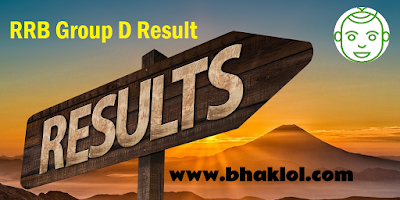 The candidature of all the shortlisted candidates for PET is purely provisional and is liable to be cancelled, at any stage of recruitment or thereafter, in case of any inconsistency/deficiency in the data furnished by them in their online application or any malpractice on the part of candidates coming to the notice of RRBs/RRCs at any stage of the recruitment process. It may be noted that merely calling a candidate for PET does not entitle him/her in any way to an appointment in the Railways. While every care has been taken in preparing the list of candidates shortlisted for PET, RRBs/RRCs reserve the right to rectify any inadvertent error or typographical/printing mistakes. RRBs/RRCs regret inability to entertain any correspondence from candidates who have not been shortlisted. The shortlisted candidates are advised to regularly visit the official websites of RRCs for the updates. The Roll Numbers of the provisionally shortlisted candidates for PET are arranged horizontally in ascending order from left to right and not in order of merit.